Pairing Try this beer with a fresh, light salad, shrimp skewers on the grill, dishes of tropical origin (like poké), and a fresh fruit and custard tart. 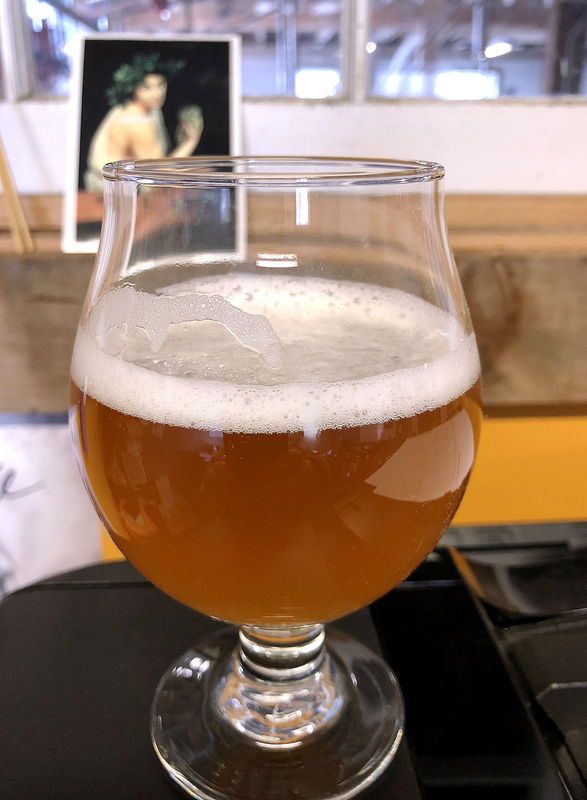 At the beginning of March, we were approached by the Portsmouth Historical Society and Discover Portsmouth to create a special beer for an upcoming exhibit featuring Gertrude Fiske. Fiske was a well known but under appreciated artist from the 20’s and 30’s who summered in Ogunquit, Maine and often painted the surrounding seacoast. Discover Portsmouth thought we would be a good fit since during the Fiske exhibit they would also be featuring a companion exhibit of local living female artists. At about the same time as this request came in, we had already placed an order for Pink Boots Blend – an exclusive hop blend put together to celebrate women in the beer and brewing industry. For those of you not familiar with the Pink Boots Society, it is a global nonprofit organization supporting women in the brewing profession. They offer scholarships that help women in the industry advance their careers through education. In fact, a portion of the Pink Boots hop blend that we bought would be going to these scholarship funds. “And I can’t remember a time when I did not recognize the fact that women and girls did not get the same air-time, shall we say, as their male counterparts.” Lainey McCartney curator of the Discover Portsmouth exhibition, “Gertrude Fiske: American Master. Discover Portsmouth asked us to make a lighter, easy drinking beer, and we were happy to oblige! Introducing Air-Time – an orange-gold colored, dry hopped grisette with a big orange citrus & stone fruit aroma (think apricot and sweet orange) with a delicate and soft mouth feel that is complemented by a bounty of apricot and fruit flavors. We think it’s the perfect beer to usher in the Spring. As always, we are excited for you guys to try Air-Time – we absolutely love it, and we hope you do, too! – Appearance: This beer is orange-ish gold in color with a very bright white head. – Aroma: The aroma on this beer makes us smile. We mostly get apricot and sweet orange, although there is a slight hint of floral from the Santiam hops. You might get a touch of clementine as well. – Taste & Mouthfeel: For a beer who’s mouthfeel is so soft and delicate, it has a surprisingly decent body. It also has such pleasant orange fruit and apricot flavors. When you take a sip, you get that big punch of fruit, with a very dry, fruity finish. It’s extremely quaffable and drinks very much like you would expect a saison and a grisette to drink. – Pairing: Try this beer with a fresh, light salad, shrimp skewers on the grill, dishes of tropical origin (like poké), and a fresh fruit and custard tart. – Serving glass: To ensure this beer’s delightful aroma shines, we will be serving this beer in a 16oz tulip glass. – Stats – ABV 4.6% and 21 IBU. Air-Time will go on tap here at Throwback Brewery on April 4th. Come on by and give it a try!